I was concerned about how comfortable a mattress we bought online would be. This is very comfortable and did not disappoint, my son loves his new mattress! 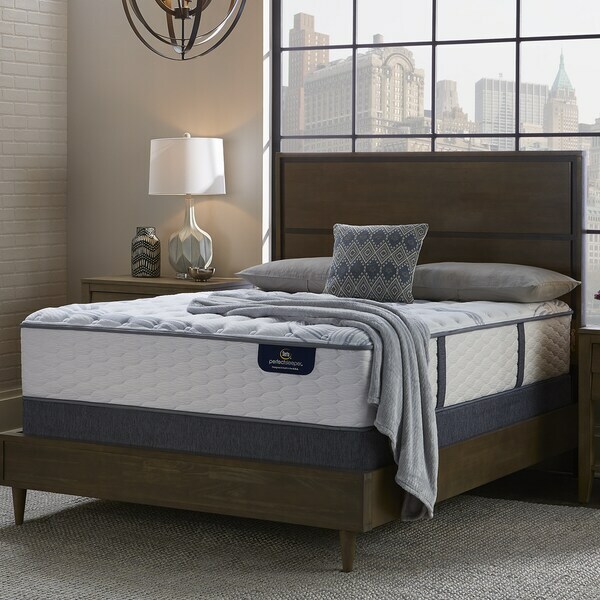 This Mattress also features a layer of Serta Support Foam, which combines gentle cushioning with extra support for more firmness throughout the mattress. Very comfortable! Firm mattress with a soft cushiony pillow top! Nice design. I love it. Great value, very reasonably priced compared to mattress stores and other online competitors. Mattress shopping is very hard and I’m glad I took my time and found this! Love this mattress! We switched from a plush to this firm mattress and my back feels much better. It seems to be giving me a lot of support. It did take some time getting used to the firmer mattress compared to our previous one, but I really like it and highly recommend it for anyone looking for a firm mattress. I like a firm mattress. I was very nervous buying mattress online without actually feeling on it. Before buying it, I went to sears to feel on the serta perfect sleeper with 886 coils and I liked it. I decided to give it a try. I haven’t slept on it yet, but I am already liking it. Not too soft, not firm like hardboard. I purchased two of these for a king size adjustable bed. Very pleased with this purchase, Fast shipping and the delivery men where very helpful. I sleep like a baby. I would buy again in a heartbeat. This is a wonderful buy. Worth every penny you spend for it. Comfortable on the first night I slept on it. It was delivered quickly with no problems. The only problem I had with it is I am short and it is very thick and high so I bought a pretty step stool. I highly recommend this mattress. The one I replaced cost me over $2,000 and was a piece of junk. Description for this mattress states firm edges. Mattress is sloppy soft. Delivered dirty from delivery company. Whole in mattress from their fork lift, the nerve that they were going to bring it my home. Overstock gave me a fast refund. Firm but not FIRM, heavy with strong edges to get right up the quality is there !!! this bed is so comfortable, its nice and firm, gotta love a firm bed! the price point is the best you will ever find also! go run and buy this mattress! We got two of these mattresses, one queen and one king. I’m 6’3” and sleep comfortably on it. Great material and comfortable. We went to a couple of furniture stores but none beat the overstock prices. Overall a good buy thus far! quality firm mattress, best deal anywhere for this model. No complaints as it is an actual firm bed as mentioned but it did start to sag and I had to flip the mattress within 1 month. Just know that you constantly have to flip this mattress so it does not sink. SO NICE, fist few nights were an adjustment period going from soft to firm. Now I wake up much more refreshed with more energy. I have never been a great sleeper and this has helped me a ton! This bed is firm without being hard. I absolutely love it!! So comfortable. What a great price and great purchase. It is for the mattress only no boxspring. I would highly recommend if you’re looking for a quality piece at an affordable price. This weighs about 71 lbs. "As previously asked, does the box spring come with it?" No, the ones that come with the box spring are listed as 'mattress set'. it will list the box spring in the description if it includes a base. "Does it come with the box spring?" Firm and no set. Good brand.